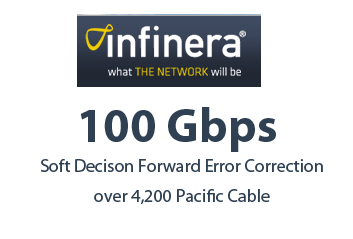 Infinera announced the first successful demonstration of a 100 Gbps signal enhanced with Soft Decision Forward Error Correction (SD-FEC) across Telstra Global’s dedicated fibre pair within Segment S5 of AAG Hawaii to California submarine cable -- a span of 4,200km. The test used Infinera’s DTN-X platform and a prototype super-channel line card enabled with Infinera’s 3rd generation FlexCoherent Processor for real time SD-FEC processing combined with the industry’s only 500 Gbps Photonic Integrated Circuits (PICs). Infinera said SD-FEC technology has the potential to double the transmission capacity of existing submarine cables with its advanced error recovery capabilities. In this test, multiple Infinera FlexCoherent modulation formats were able to close the link with no bit errors detected. Infinera’s FlexCoherent technology enables its line card to be configured for a specific modulation format via simple software controls. "We are delighted by the results of this field trial and this shows further increased capacity potential for Telstra Global’s leading submarine cable plant. Our continuing focus on cutting edge technologies will enable us to continue to deliver new services to our customers and meet their future capacity needs with a long term, reliable offering," stated Martijn Blanken, Telstra's Global Managing Director. "We are pleased to see that our 3rd generation FlexCoherent™ Processor along with 500 Gb/s PICs, is performing exceptionally in real world environments. Over the past few months we’ve shown that a PIC-based long haul super-channel implementation can deal with record-breaking levels of PMD impairments in fiber; deliver a full 8Tb/s of capacity on Dispersion Shifted Fiber that service providers might have written off as useless, and now with Telstra’s help we’ve shown that with the addition of SD-FEC, this technology is capable of being deployed on some of the longest and most challenging cable routes in the world," stated Dr. David Welch, Infinera's co-founder and Chief Strategy Officer. Huawei said about 70% of its revenue was generated from serving leading telecommunications operators, including 45 of the world's top 50. 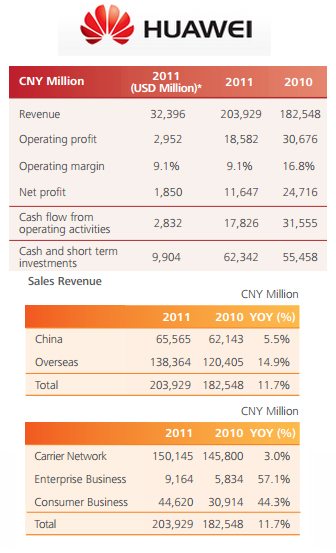 Consumer business group -- CNY 48.4 billion -- sales continuing to grow in developed markets including Europe and Japan. Enterprise business -- CNY 11.5 billion. R&D expenses in 2012 were CNY 29.9 billion (US$4.81 billion) , representing for more than 13% of the year's revenue. The domestic market in China recorded CNY 73.6 billion in revenue. Overseas revenue was CNY 145.3 billion (US$23.36 billion) or 66% of overall revenue: Asia-Pacific region saw revenue of CNY 37.4 billion (US$6.01 billion) , while Europe, Middle East and Africa recorded CNY 77.4 billion (US$12.44 billion) and the Americas contributed CNY 31.8 billion (US$5.18 billion). 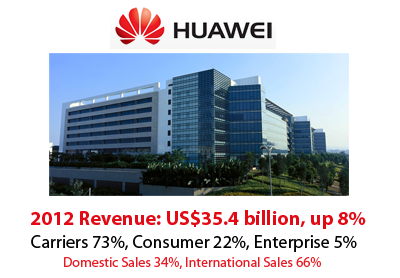 "We insist on strictly controlling G&A expenses and allocate more resources to bolster the front line and ensure continuous improvements on customer delivery and service quality," said Ms. Cathy Meng, Huawei's CFO. "In addition, Huawei continued its ongoing management transformation, raising combined operating efficiency with an integrated financial services program." Huawei noted that its results are audited by KPMG. The annual report will be released in April. 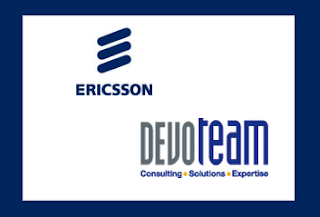 Ericsson agreed to acquire Devoteam Telecom & Media (France) for its consulting and systems integration for operations and business support systems, service delivery platforms and applications, IP Multimedia Subsystems, IP and radio networks and TV. Financial terms were not disclosed. Devoteam Telecom & Media represents about 7% of Devoteam’s global turnover. "Acquiring activities of Devoteam adds unique expertise in complex, strategic and technical consulting engagements that will enable us to immediately enhance the value that we bring to our customers," says Magnus Mandersson, Ericsson's Executive Vice President and Head of Business Unit Global Services. "It is further proof of Ericsson's commitment to act as the partner of choice for the business transformation currently taking place within the telecommunications industry." Derek Nutley, Telecoms Director at Devoteam declared: "This transaction fits with Devoteam's 2015 strategic plan. It will allow us to focus more on innovation around the Devoteam's value proposition. Ericsson is a key business partner of Devoteam - notably in UK and Mediterranean countries - and we hope that this transaction will further strengthen our relationship. I am convinced that the teams of Devoteam Telecom & Media in France will benefit from Ericsson's end-to-end know-how, scale and global presence." Alcatel-Lucent has been selected to upgrade a 9,600km trans-Pacific digital submarine cable system that provides direct connectivity from the Japanese east coast to California. The cable, which is owned by 5 major carriers, originally was designed for an ultimate capacity of 960 Gbps per fiber pair. The upgrade will quadruple its original design capacity by use of Alcatel-Lucent’s advanced coherent technology, delivering an ultimate capacity of up to 4 Terabits per second (Tbps) per fiber pair. The upgrade is based on the Alcatel-Lucent 1620 Light Manager submarine line terminal equipment using coherent technology at 40G, expandable to 100G, and managed by the Alcatel-Lucent 1350 optical management system. The solution was demonstrated earlier this year on the trans-Pacific submarine cable system network. NEC announced a test of a 1 Tbps super-channel based on 100GbE subcarriers and transmitted over a trans-oceanic distance. NEC's super-channels are achieved using techniques such as parallel high-speed transceivers, advanced modulation formats and advanced pulse shaping. For this trial, NEC combined a software-defined pulse shaper together with flexible-grid real-time 100 Gbps subcarriers to create a 1 Tbps superchannel. The pulse-shaper is designed to mitigate transmission impairments and to offer flexible bandwidth allocation capabilities. NEC reported error-free transmission over a 5,400km link consisting of commercially available optical fiber and cost-effective repeater spacing. 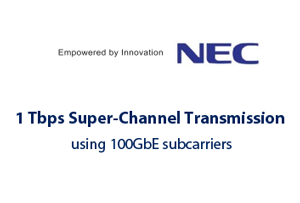 NEC also implemented a 1 Tbps superchannel composed of full-digital100 Gbps subcarriers. Each subcarrier is equipped with a digital signal processor at the transmitter, which can potentially extend the re-configurability to a variable modulation format and/or for variable error-correction capabilities. This cutting-edge digital-transmitter technology enables the 1 Tbps superchannel to successfully transmit beyond 7,200-km. Citing delays with some domestic and international network projects, the recognition of earlier lower-margin contracts and a drop in revenue for terminal products, ZTE may post a net loss of between RMB2.5 billion and RMB2.9 billion for full year 2012, a reversal of 221.35% and 240.77% compared to a year earlier. However, ZTE is forecasting a profit in the first quarter of 2013 as a result of the company’s operational review and strategic realignment efforts. control its growth in employee numbers, reduce unnecessary consumption, and improve efficiency. sharpen its focus on mainstream customers and products, improving internal coordination to ensure resources are channeled into the development and innovation of key projects. streamline its internal organization to form simplified, three-layer structure, comprised of headquarters, operational division and representative office, thereby eliminating some regional and structural groupings. In December, China Development Bank (CDB) agreed expand its financing facility for ZTE to US$20 billion. 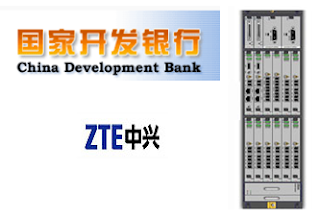 Citing the uncertain economic recovery in the United States and the debt crisis in Europe as primary factors that weaken growth in the global telecommunications market, CDB said its financial support could help ZTE achieve a stronger market position internationally.